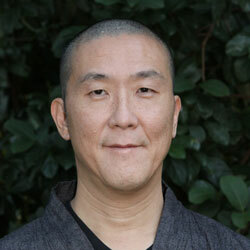 Guo Gu (Jimmy Yu) is a Chan (Zen) teacher and a scholar. He is the founder of the Tallahassee Chan Center and leads retreats in different parts of the world. He is the author of Essence of Chan and Passing through the Gateless Barrier. As a Buddhist scholar, he teaches at Florida State University and has published many articles on Buddhism and Asian religions.